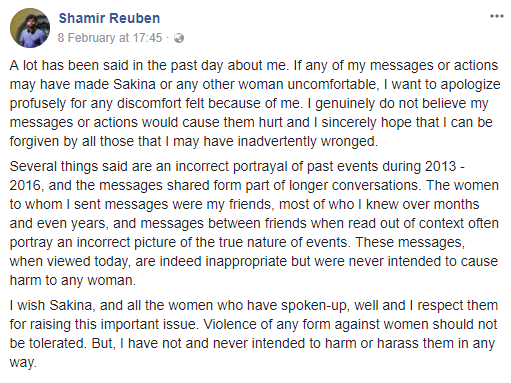 * Sakina Bootwala writes a post (right) naming Shamir Reuben, one of the most recognised faces in the English-language performance poetry circuit, as a sexual harasser. As the day passes, more and more women share their stories with Sakina, causing her to realise that the problem wasn't just limited to her, but was an epidemic with shades of pedophilia and the modus operandi of a sexual perpetrator—the girls were between the ages of 14 to 16 when the inappropriate correspondences began, while he was 19; they continued well into his early 20s. Apart from being a well-known poet, Reuben was also a much-revered feminist who was vocal about women empowerment. * Shamir's (now former) best friend, Harnidh Kaur responds to the allegations after a few hours of being barraged for one, where she disavows her friendship with him and expresses disappointment and anger at the revelations. Although many alleged that she was in the know, including her own friends, she has maintained a silence on that front. * Kommune, a performance platform in Mumbai that employed Reuben also releases a Facebook post (right) with the news that he has been suspended pending an internal enquiry. * By the time the second day rolls around, the number of allegations has increased to more than twenty, and Sakina has to start a new post. * Shamir releases a response via Facebook (right), following the tradition of the worst sorry-not-sorry perpetrators. In it, he sweeps his actions—well documented in screenshots of many conversations with many underaged women, available in Sakina's post—under the carpet and avoids apologising completely. * His response is not received favourably by those in the poetry community, and is panned by most in no uncertain terms (below). * Story Fest Chandigarh releases a Facebook post announcing Reuben has been dropped from the performer's list. * Buzzfeed, which had just a few days prior named Reuben as one of "21 modern Indian poets who will make you fall in love with poetry", removes him from their listicle, and publishes an account of the Facebook name-and-shame. * Mumbai Mirror releases a report which was thoroughly condemned by Sakina and others for being insensitive and unverified. * A few feminists come together to create a list naming a few well-known poets and writers in India as abusers and sexual harassers. In light of the Reuben accusations, the list is a necessary response to protect women and femmes from violence in the poetry scene. * However, one of the men named in the list, Ambikesh Sharma issues a public denial (top right) of the accusations, causing many to disavow the list. * The tide turns again when Nimisha Srivastava, the victim who had stayed anonymous previously, decided to come out with proof publicly (right). Ambikesh retracts his denial in the face of proof. Update: We closed this story on 31.03.18, and are unhappy to report that nothing much happened to Shamir Reuben.